Gold prices have given the sign I was waiting for, and I have made my gold trading re-entry. Gold futures trading pushed prices down this week, and I saw my opportunity to re-enter my lost long position from last week. Re-entry occurred at 9:01 my time at a price of 1708 in the June contract for gold futures. As always, a stop- loss is in place to limit my exposure to risk. If I don't get stopped out, then I plan on holding this trade into the early summer. If you've been reading this futures trading blog, then you know that I've been bullish on gold for a while and that I've been looking for entry opportunities. I entered a trade late last week, but my timing was wrong and I got stopped out. This occurred because I failed to wait for the right signal. I believe that signal has shown itself now. If not, then I will be stopped out at a small loss. Observe the daily chart for the June 2013 contract for gold prices. Observe the area encircled with the red circle. We can clearly see that gold prices have touched down onto the blue moving average I have set. This was my cue to look into the 60 minute trading chart and wait for a my signal. This is essentially an example of swing trading gold. 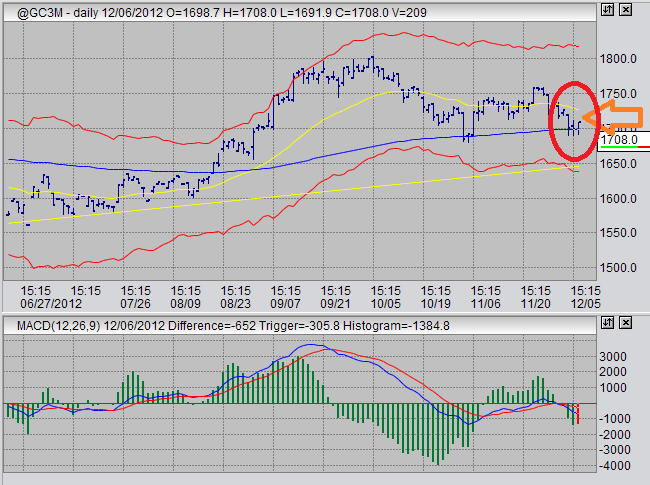 The orange arrow indicates my entry point at 1708, once I had observed my signal. My entry point was a little bit late, as the signal was actually in the upper 1690's. This means that if my analysis was wrong and I do get stopped out, I'll take an extra 10 points in my loss. I plan on holding this trade for several months, perhaps into the spring. That is, assuming I don't get stopped out. Crude oil is taking a plunge today, and I need to see another decline of around 1.00 to 1.50 before we get into the range at which I would consider taking a long position. If we do see that drop, I will re-examine my criteria for going long, and if everything is still the same I will wait for an entry signal on the daily and 60 minute time frames. Natural gas did something quite funny today. We had, what I think to be, a quite bullish EIA natural gas storage report. It was -73 (in whatever units they use), which was lower than many estimates by a small margin. However, last week we were still using positive numbers. To me, this is a pretty bullish report. We did see that bullish MACD divergence on the 60 minute chart, which prompted me to enter a trade. A trade that I exited this morning at a 0.135 point profit after seeing the bearish MACD divergence on that same time frame. Assuming things don't reverse dramatically before the end of the day, which they very well could, what we are seeing here is a prime example that technical analysis shows us much more than we could hope to get from fundamental analysis. You just can't get the entire set of information on time when it comes to fundamental analysis. You just can't. So how can you expect to trade ahead of the game if you only use fundamentals? Technical analysis, on the other hand, gives you an image version of the full fundamental data. I like to take advantage of technical analysis, both for trading decisions and for trade management. This topsy-turvy behavior is quite typical of natural gas futures. Other stocks or futures don't behave quite so strangely. I am still watching sugar prices with a keen eye.